Happy Thanksgiving From The Zimak Family! Happy Thanksgiving from the Zimak Family (Eileen, Gary, Mary and Elizabeth). We are grateful for your support and prayers through the years. May God continue to bless you today and every day! How many times have you heard that advice? While it makes sense in some cases, looking back can also be beneficial at times. When I look back through the years, I’m amazed at the many miracles that the Lord has worked in my life. He has done the “impossible” more times than I can count. And yet, like many of you, I sometimes forget and begin to panic when faced with a frightening situation. 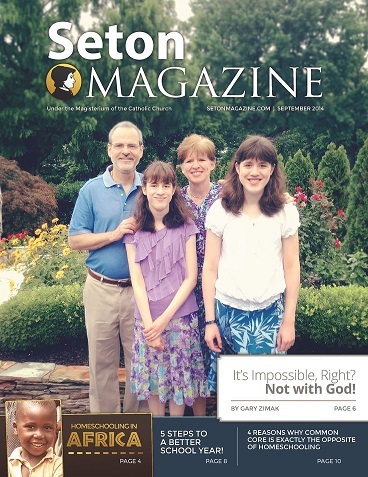 In this month’s issue of Seton Magazine, our friends at Seton Home Study School were kind enough to let me tell the story of some of the miracles God has performed in the life of the Zimak family. While the article centers on our experience with homeschooling (something my wife and definitely thought was impossible before we tried it), I list many other examples of God’s miraculous intervention in our life. As a full time Catholic lay evangelist, I spend a lot of time speaking and writing about God’s miraculous power. Even though the Bible assures us that “with God, nothing will be impossible” (Luke 1:37), our human side often says, “Yeah, right!”. We can read countless stories of miraculous healings in the pages of Sacred Scripture, but somehow we have difficulty trusting when faced with a crisis in our own life. Like the Apostle Thomas, we often need some visual proof that miracles really do happen. Sixteen years ago, after struggling with infertility (and, believe me, it was a struggle), my wife Eileen and I were THRILLED to discover that she was pregnant. We were even MORE THRILLED to learn that we’d be having twins! That excitement lasted for one hour, when we received a call from the doctor informing us that both babies were in serious danger. The following day, we were told that our twin girls were suffering from Twin to Twin Transfusion Syndrome, which is often fatal. What was especially difficult in our case was that Eileen was only in her 18th week of pregnancy. At the time, there was very little that could be done medically, but the doctors were going to “try” to do whatever they could. We were devastated. Immediately, we named the girls (Mary and Elizabeth) and we began to pray. 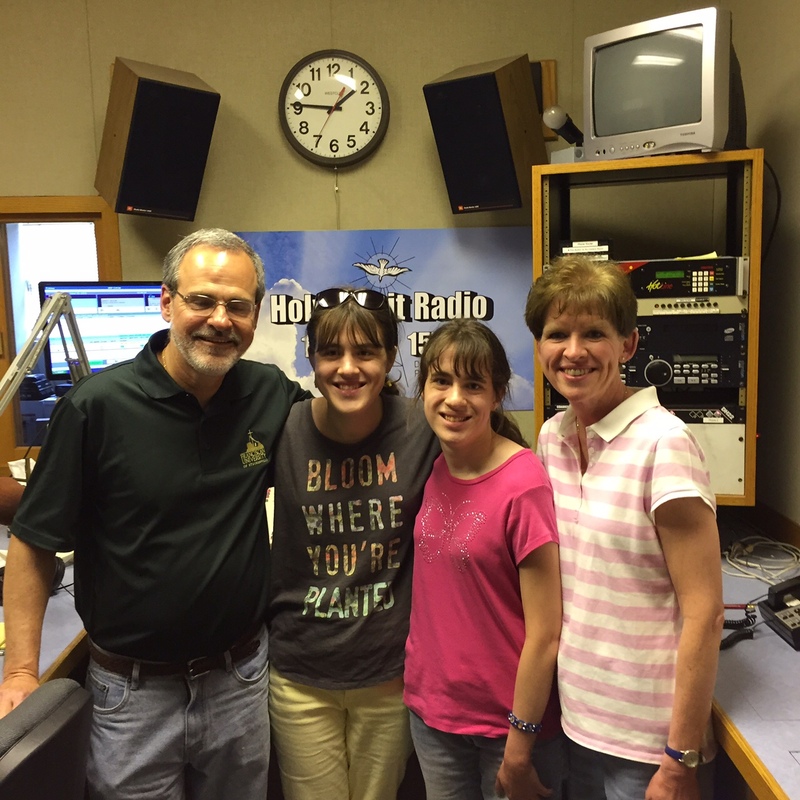 We wrote to newspapers, called into Catholic radio programs and asked everyone we could think of to intercede for the girls. Although my faith wasn’t the greatest at the time, I prayed as if their lives depended on my prayers. As the weeks progressed we were blessed with more prayers and inspirational messages than we could count. We were also told numerous times that the girls would die. Yes, the doctors didn’t pull any punches with us. Somehow, however, we felt a sense of peace throughout the entire ordeal. Now, before you dismiss this post as the “cutesy” gushing of a proud father about his daughters, I want you to remember something. In your lives, you may be facing or will be facing many challenges. You may be told by doctors that you or someone you love has an incurable illness. You may be unemployed and feel that you will never get a job. You may wonder if your children will ever return to Church. In all of these cases, you will be tempted to accept the conventional wisdom of the world and stop believing in miracles. During those times, I’d ask you to remember the story of Mary and Elizabeth Zimak, who are alive and healthy. The Lord can AND DOES still perform miracles. Don’t ever stop believing that. He may not always answer your prayers in the way you’d like, but have confidence that He always answers them in the way that is best. 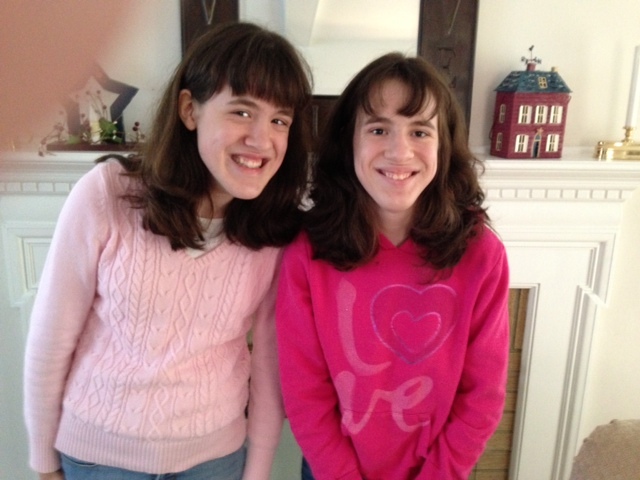 Finally, Eileen and I would like to wish Mary and Elizabeth a happy 16th birthday. Mom and I love you, girls. 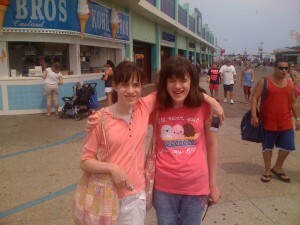 Thanks for being such great daughters and for reminding us that God still does perform miracles! Don’t Let Fear Stop You From Saying “Yes”! Are you kidding me? The author of A Worrier’s Guide To The Bible and a frequent speaker on conquering anxiety is saying that there’s nothing wrong with being afraid…what’s going on here? Well, friends, I really did mean what I said. As I often state in my parish talks, fear is a perfectly normal emotion in certain circumstances. It can even be helpful, especially when it motivates us to DO something. On the other hand, fear becomes a problem when it leads to worry or causes us to NOT do something that we should do. Share our Faith with others, some of whom may react in a hostile manner. Apologize to someone we have offended. Trust in His providence by accepting a lesser paying, but more rewarding job. Offer up our illness or suffering. Two years ago, after dismissing the idea numerous times as being “impossible”, my wife and I felt that we were being called to homeschool our children. Although we were afraid and skeptical, we trusted (barely) that the Lord would be there for us. We said, “yes”. A few months later, I was laid off from my day job, and we decided that I should finally try to earn a living as a full time Catholic Evangelist. Again, we again said, “yes”. To be totally honest, however, we were scared to death both times. What we’ve discovered in the past two years is that if you say “yes” to the Lord (even if you’re terrified), He can do some incredible things in your life. Even better is that, the more you trust, the more He’ll increase your faith. 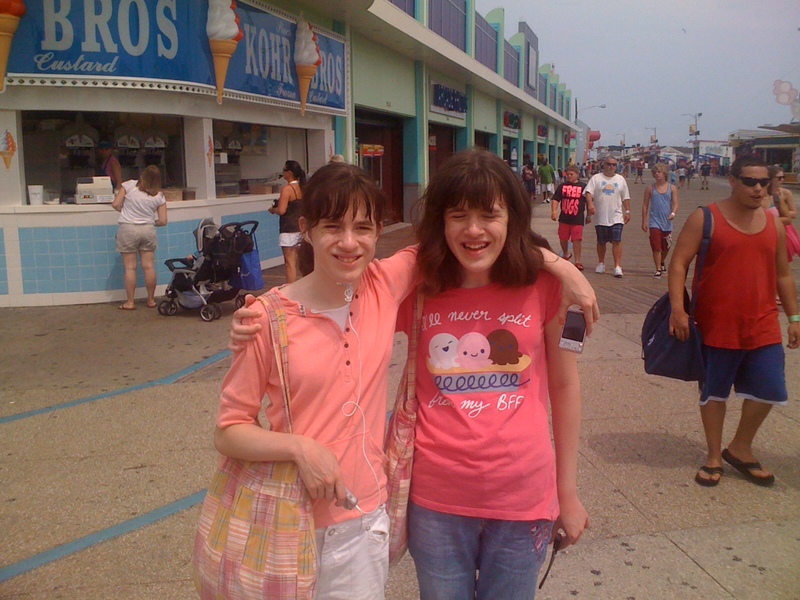 Happy 15th Birthday, Mary & Elizabeth! On this day, 15 years ago, I got to witness a miracle. After being told for several months that our daughters would probably not be born alive, Eileen and I welcomed Mary and Elizabeth Zimak into the world. Although they weren’t due for another 3 months, the doctors felt that delivering them prematurely would give them the best chance for survival. They were right. Today, the girls celebrate their 15th birthday and are completely healthy! 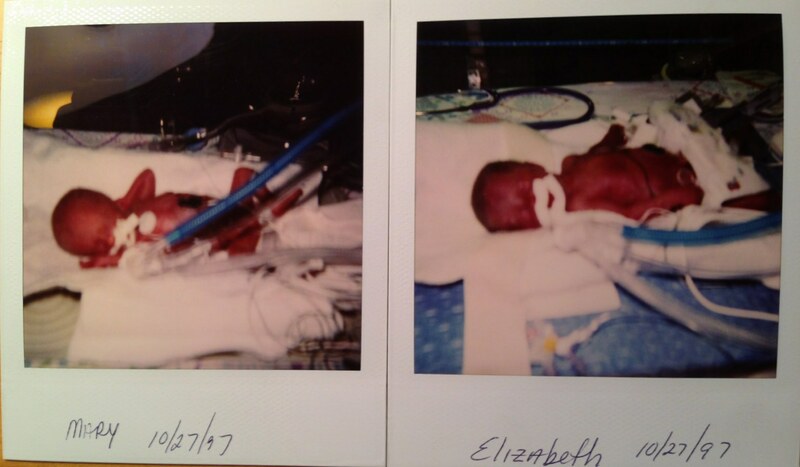 Sometimes I forget the slim odds as the girls were afflicted with Twin-to-Twin transfusion syndrome (a very serious condition that affects identical twins), how Mary only weighed 1.5 pounds when she was born, how Elizabeth was born with congestive heart failure and how they both faced numerous medical issues related to their prematurity. On this day each year, however, I don’t forget. I remember all of the negative comments made by the doctors. I remember how the initial diagnosis shattered the joy of our first pregnancy. I also remember the prayers of many people and the peace that Eileen and I felt in the midst of a full blown crisis. This Sunday’s Mass Readings feature the story of Bartimaeus the blind beggar. When he called out to Jesus, he was told by the crowd to be silent, but he ignored them. Instead, this desperate man called out again and was healed by the Lord. Two thousand years later, we still encounter many people who will tell us that our faith is unrealistic and that God can’t perform miracles. They’re wrong. He can AND DOES still perform miracles and I have two of them living in my house! Happy Birthday, Mary and Elizabeth Zimak. Mom and I are so proud of the great young ladies you’ve become. Every person who has ever met you have told us how “sweet” you both are. I always believed that you would help many people if you were allowed to live and you’ve done just that. By being so kind to everyone, you’re imitating Jesus and that’s exactly what we’re all supposed to do. Thank you for bringing so much happiness to Mom and I.